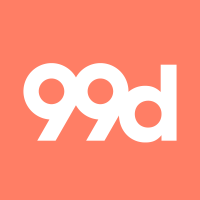 99designs is the worlds #1 marketplace for graphic, logo, web and other design contests. 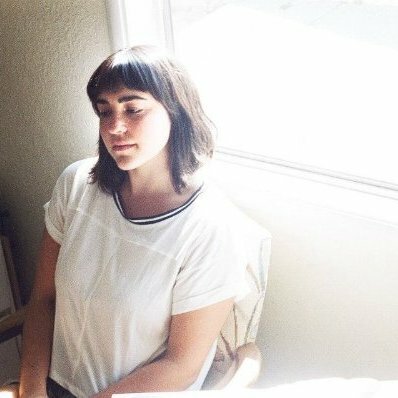 We caught up with Brea Weinreb to learn how they use BuzzSumo at each step of their content marketing process. Brea and her team use BuzzSumo at three stages of the content marketing process. First for research, then to identify influencers and finally for distribution and analysis. 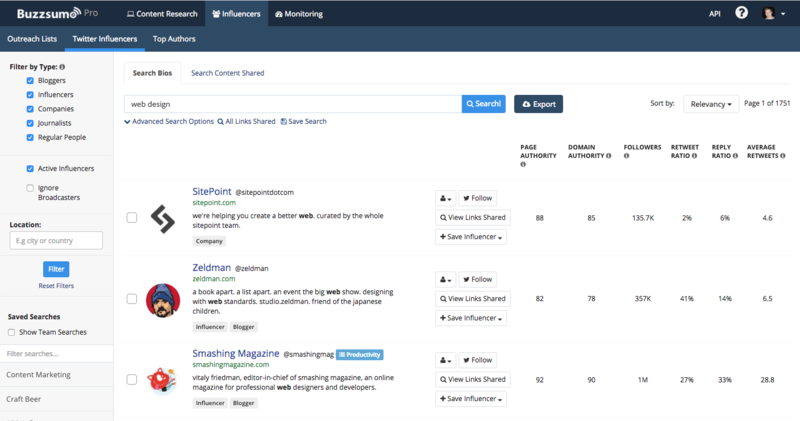 Before the team write or send-off a writer’s brief for a content campaign, they start by researching topics in BuzzSumo. 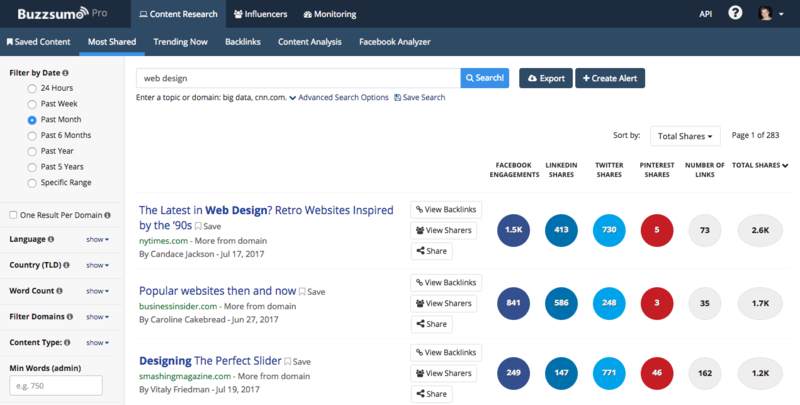 BuzzSumo has a number of content research tools that allow you to find and analyze the most shared content for any topic, see what’s trending across the web today and even find which Facebook posts are getting the most engagement. They start by searching for a keyword in the Most Shared tool. This shows them what is already out there to be improved upon and helps identify possible gaps in existing content. Taking note of the articles that got the most shares, they try to find trends. For example, is successful content being formatted as roundups, case studies, predictions? What are the common topics and keywords being mentioned in headlines? This gives them a comprehensive list of the best content to be included in the writer’s brief. What has worked well for the topic “web design” recently? What can be improved? While the blog post is still in the process of being written, Brea and her team start their influencer research to see who they should target when distributing the article. The importance of having a clear distribution plan in place cannot be understated. Sharing your content with relevant influencers is one of the best ways to amplify its reach. There are two parts to this: Influencers and blogs for guest posts. They use the Influencers section to look up people that are “experts” in the niche topic they are covering. Secondly, they create a list of bloggers to reach out to for guest posting on their blog. They use BuzzSumo’s tools to find people and build a list. They usually approach bloggers before the article is written so they can gauge interest. Once the article is published they will distribute it to the influencers found through BuzzSumo, send it to the bloggers via Buzzstream, and keep track of all our interactions in BuzzSumo. They also go back to the Content Research tool and look at the sharers for similar articles. They will approach them with their article if they think it’ll be of value. All valuable influencers discovered through this process are added to an influencer database so they can work together again in the future. They also tag them in a BuzzSumo Outreach List so they can easily use in future projects. At the three week benchmark they check how many total shares and links they’ve got using BuzzSumo’s backlinks and research tools.